The author is an associate professor and extension forage specialist at the University of Georgia. Dairy producers have to keep a sharp pencil to ensure the milk check covers all their costs, but there is one factor that probably never shows up on the balance sheet that can help keep the farm in the black: soil organic matter (OM). Scientifically speaking, soil OM is a collective term that refers to the amount of carbon-based material in the soil. In a sense, soil OM quantifies the living component of the soil (such as roots, fungi, bacteria and earthworms), as depicted in the photo on the opposite page. But why does soil OM matter? 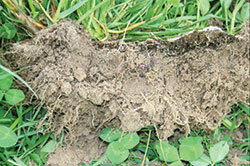 Soil organic matter acts as a sponge. It holds water; improves the soil’s cation exchange capacity, allowing it to hold more nutrients; and provides a host of other advantages. Dairymen who farm sandy soils, like those in the Coastal Plain of the southeastern U.S., need all the help that they can get with these soil properties. Often, having good soil OM and the benefits that come from it can be the difference between losing and making money. Since 2005, there has been dramatic growth in the number of pasture-based dairies not only in Georgia but the entire Southeast. In Georgia, nearly 20 percent of the dairy herd is now “out to pasture.” Most of these new farms have been going in where cotton, peanuts and corn had been produced for decades. 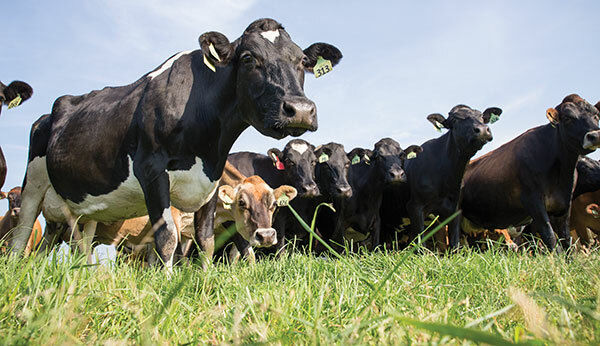 A few years after these new pasture-based dairies were up and running, several of the producers indicated they were noticing some major changes in their pasture’s productivity and need for inputs. These producers reported that they were irrigating less and needed progressively less nitrogen fertilizer to get the same amount of pasture productivity. They were good graziers and knew that their soil OM was going up and providing these very positive side effects. Crop and soil scientists from the University of Georgia began to take soil samples to monitor these changes. The preliminary results on one farm showed the soil OM had increased from 1.1 percent at a time point three years after conversion to over 2.1 percent in their farm’s sixth year. Such rates of soil OM improvement are unprecedented in the scientific literature. In fact, these results were so striking that no one in the group believed the data. Subsequently, a research study was initiated to take a closer look at what was happening. The study, published in Nature Communications in late April of this year, confirmed that soil OM is drastically increasing. The results are most astonishing in the top few inches of the soil on these farms (Figure 1). Five years after conversion, soil OM in the top 4 inches of soil had essentially tripled. Additional research showed that the fastest rate of soil OM accumulation occurs on the pasture-based dairies between two and six years after converting from row crops. Carbon (C) in the top 12 inches of soil (OM is about 58 percent C) rose by approximately 3.6 tons of C per acre per year (Figure 2). Incidentally, this rate of soil OM buildup is among the highest rates ever recorded in any system. In fact, if one considers that the average automobile produces 1.5 tons of carbon per year, the average 500-acre, pasture-based dairy farm in Georgia is sequestering the annual carbon emissions of over 1,200 vehicles. According to EPA estimates, 5.6 tons of CO2 per year x CO2 is about 27 percent C. In other studies, prediction models developed by USDA’s Agricultural Research Service and refined for Georgia forages and conditions showed that pasture-based dairying in the Southeast has a carbon footprint similar to the freestall dairies in this region (on per unit of milk produced basis). Soil organic matter is comprised of many components. It is worth noting that Rome wasn’t built in a day and neither will soil OM. The soil OM on the pasture-based dairies we studied did not show much gain in the first one to two years following conversion. This is probably the result of a lag in getting the population of soil microbes and earthworms built up. Additionally, it is unclear if that high rate of OM buildup can continue. In some of our older pasture-based dairies, the soil seems to have stabilized at 3 to 4 percent OM, indicating that soil OM levels will eventually plateau. In addition to continuing to monitor soil OM levels, this research has now moved into trying to determine which part of the forage system contributes the most to this change in soil OM. The preliminary results seem to indicate that the roots and root exudates are the major sources of soil OM improvements. These results support the findings of a consortium of American and European scientists in a recent review in the journal Nature. Their report conclusively showed that roots and root exudates are the primary source of soil OM buildup, disproving the long-held dogma that crop residues and biomass on the soil surface are the primary sources of soil OM buildup. “Carbon footprint” is a common catch phrase these days, but this research is now beginning to examine the “carbon fingerprint” of our forages. Cool season and warm season forages have distinctly different carbon radioisotope signatures. By monitoring the radioisotope signatures in the roots, plant litter, and animal manure from these different forages, scientists can better understand how much of the OM buildup is due to each of these forage types and the degree to which manure is playing a role. In so doing, scientists hope to build a forage system that provides high-quality forage crops that suit the needs of the rumen microbes and the soil biota. This article appeared in the August/September issue of Hay & Forage Grower on page 6 and 7.